Not quite out yet, but the Heavy Soul! modzine issue 30 should be available later this month. 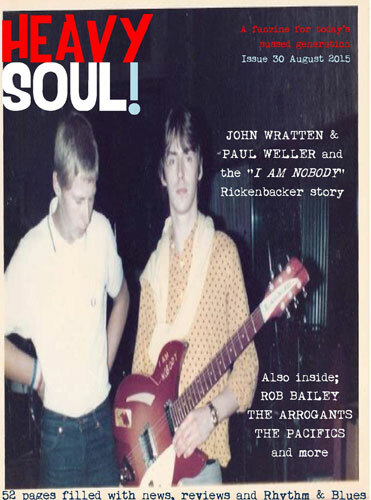 This time out you’ll find interviews with head of the NUTS and rally organiser Rob Bailey, the story of the day Paul Weller sold Small World’s John Wratten his ‘I Am Nobody’ Rickenbacker, Ed Silvester on the day he saw The Jam at the Marquee, French R&B band The Arrogants and Irish Beat Merchants The Pacifics. New releases, eBay finds, news and more as well, not to mention a 25-track CDR of mod-friendly grooves. Keep an eye out on the website for availability, price is £5.50.